Heat oven to 375°F. Line rimmed cookie sheet with cooking parchment paper or foil. Unroll dough (do not separate into rolls). Fold dough in half vertically, and use kitchen scissors to cut at fold. Place each half on cookie sheet, with seams vertical. Bake 17 to 19 minutes or until pizza base is firm and browned. Meanwhile, in medium microwavable bowl, mix cream cheese and cinnamon roll icing. Microwave uncovered on High 30 to 90 seconds, stirring after 30 seconds, until smooth; set aside. In small microwavable bowl, microwave chocolate chips uncovered on High 30 to 60 seconds, stirring after 30 seconds, until melted and smooth; set aside. Spread cream cheese mixture evenly over baked pizza base. Top with raspberries. Drizzle with melted chocolate. Feel like mixing it up? Try blackberries instead of raspberries. 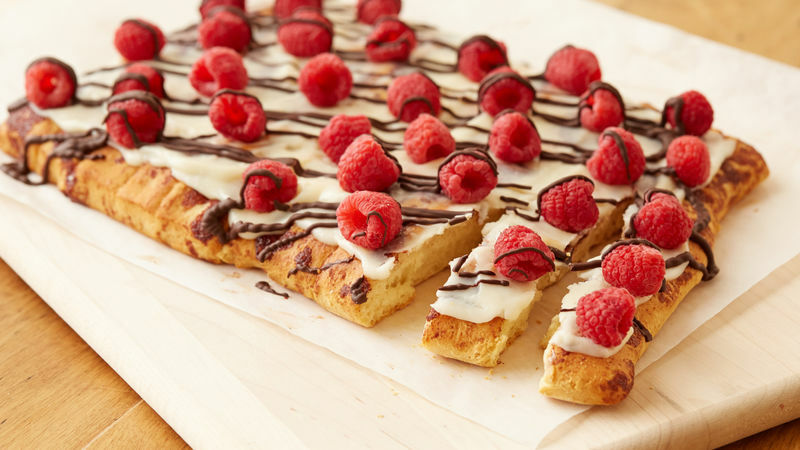 When placing raspberries, make sure you get the edges of the pizza, too, so each pull-apart piece gets some fruit.